How did Judas Iscariot point out Jesus in Gethsemane? We Are In GENEVA - To Stay! "Behold, I set before you an open door and no man can shut it," promised Jesus Christ to His Church! 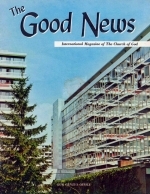 Read here HOW the door to establish an office for God's Work to the French-speaking people was OPENED - and nearly shut - in Geneva, Switzerland! GENEVA is a truly international city. It has a complement of over fifty world organizations, such as the European offices of the U.N. organization, the International Red Cross, the offices of the World Ecumenical Movement, etc. - all of which are an attempt to fulfill man's vain ideals for peace. It is also a cultural city of distinction, has a superb orchestra and notable university. But, most important of all, Geneva is also the European center from where God's Message to the French-speaking peoples is carried.